You’ve decided it’s time to make your relationship a little more formal. Or a lot more, actually. You’ve decided the time is right to propose. You have all the ideas in your head about the hows and the wheres, but what about the ring? It’s a big enough step, buying an engagement ring. It’s a huge step if you plan to go it alone for a surprise proposal. Being clever and finding the size of your hopefully soon-to-be-fiancées ring finger is just the beginning of things. A far bigger deal is knowing the style of ring she will like. What gemstone(s), what metal, what design? There’s no doubt that she will show a ton of joy and delight when you propose, regardless of what ring you present. However, there’s also little doubt that it will be the occasion, the event, which provokes such a response. It’s even possible that the actual details of the ring will be largely unnoticed for several minutes, or even hours, after. At some point, though, the ring will become the main attraction, especially for friends and family. Not that your fiancée will ever not like the ring, but isn’t it worth taking s little time to figure out what she will not just like, but love? It’s a fact that any woman will have a jewelry collection – most of which was personally chosen by her. This is your first huge clue to the type of jewelry she likes. More specifically, the style of ring she likes. Even a quick glance at her current jewelry will tell you whether she likes big and bold or soft and subtle. The intricacies will be part of it, but even just getting an overall “feel” for what she likes is a great start. 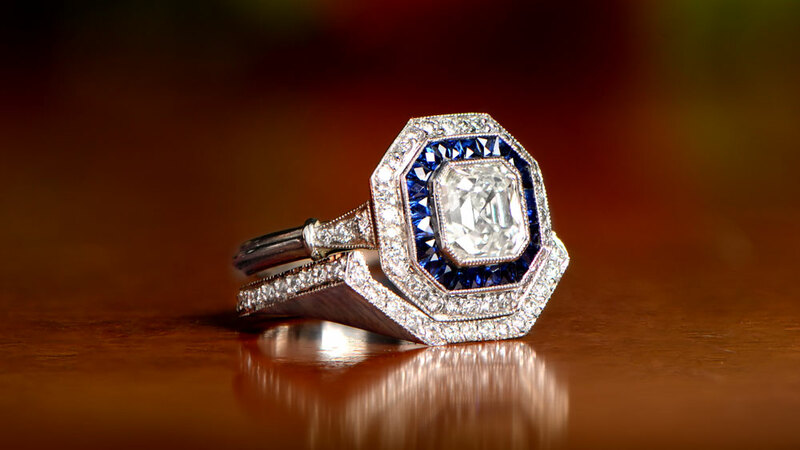 You may see every ring style from classic to contemporary, in her jewelry box, but it is likely one will dominate. Take this as a starting point for which style of ring you should browse. It’s worth mentioning, at this point, that a good jeweler will be your best friend here. With even the scantest of descriptions or ideas, an experienced jeweler will be able to suggest a whole range of rings which might suit your needs. Never be afraid to ask. Expert Tip: To get the right size, borrow one of her existing rings that she wears regularly and take it with you. The jeweler will tell you instantly what size it is. Just don’t let her catch rifling through her jewelry! Alternatively, you can purchase a Ring Sizer Kit from Amazon and put the ring over the business card. Which Stones Should You Choose? Is there anybody in the world who doesn’t equate engagement rings with diamonds? Whilst diamonds are the most popular choice, by a considerable distance, don’t rule out other options. Rubies, emeralds, and sapphires are also very popular in engagement ring settings. Usually, though, if other colored gemstones are the main choice, diamonds are used to emphasize the impact and add contrast. There are also more affordable options like mossanite and cubic zirconia. But, for now, let’s stick with a diamond as your gemstone of choice. It’s a fine choice, and also the safest option for an engagement ring. You have two basic choices. 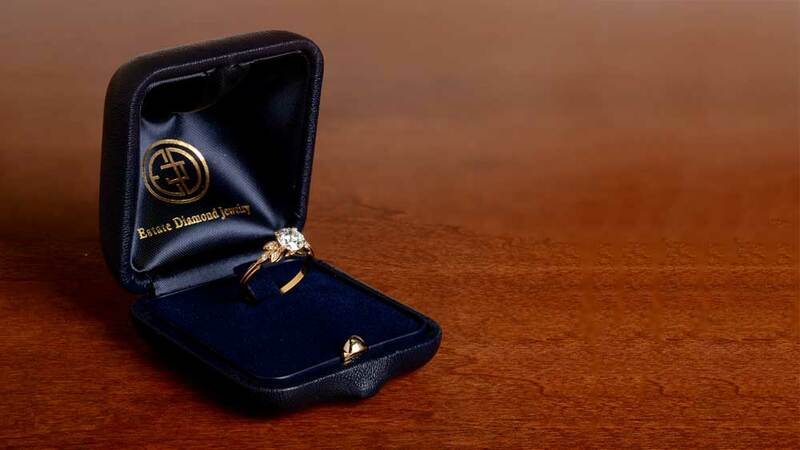 You can have a ring designed from scratch, or you can buy a vintage engagement ring. Several large online diamond sellers now have ring design features on their websites. You choose your diamond, choose your settings, and the company will make your ring for you. There are now so many available ring setting styles, that you will be spoiled for choice. Choosing a vintage or antique diamond engagement ring will limit your choice in both style and availability. However, rings with a history are incredibly appealing, and are always unique due to their hand made nature. If she is passionate about history, vintage jewelry, rare jewelry or collectible items, she would probably love a vintage ring. If not, assume that she would want a modern ring. Just about every design you can imagine, to hold a diamond in place, is available in the modern day. Everything from a simple solitaire setting to an ultra-modern tension setting is possible. This is where your sneak peak in her jewelry box will pay dividends. But, regardless of how the metal is constructed, how the diamond or diamonds are used are also important. When we use the term setting, it takes into account both which stones are used and how they are set. But it also come to apply to the style of the band and other metal work which may be used. A solitaire setting is no more complicated than just a single diamond. No other stones are used, and the diamond is usually in a prong setting. It’s a classic look, and has no downsides to it. A halo setting has a single diamond at its center, and a ring – the halo of the name – of other diamonds or colored stones around it. Halo settings, as well as being stunningly beautiful, serve to make the center diamond look larger than it really is. Pavé comes from the French for pavement or path. As a result, it describes small diamonds being inset into a path around the center diamond or on the shoulders of the band. It differs from a halo in the cut and setting of each individual stone. With modern manufacturing techniques, nothing is impossible. Whether your fiancée likes lines or curves, swirls or corners, there will be a setting, and a band style, which will appeal to her. Don’t be afraid to browse online or ask your jeweler to show you the options. There are several diamond cuts available for engagement rings. By far the most popular is the modern round brilliant cut. The round brilliant is probably the most flexible cut in terms of its suitability for the various settings. It works in just about any design, and looks great in all of them. Another popular cut is the cushion cut which is nominally a square cut that is curved along all 4 sides to resemble a pillow, hence the name. The short answer here is that there is probably no wrong choice. Your choice of band and setting is probably more important, as long as the diamond you choose suits the band and setting perfectly. Some cuts, though, do suit some hand shapes more than others. Oval or marquise cuts help to elongate the fingers, which can be a benefit to someone with smaller hands. 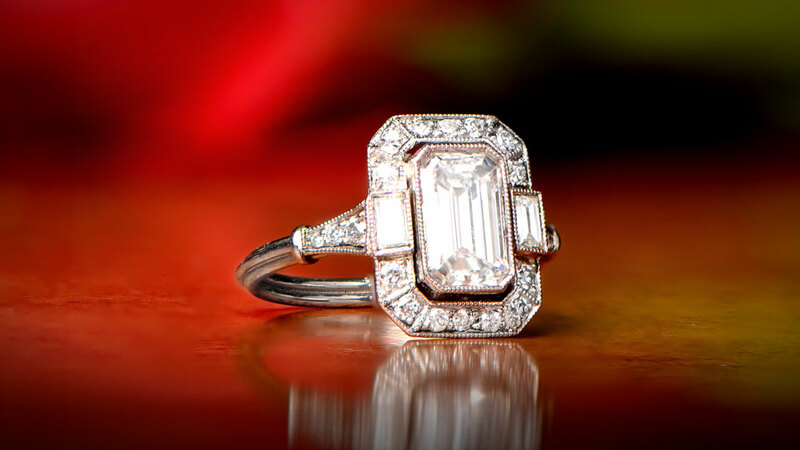 Other cuts, such as the emerald cut can make the diamond appear larger due to it’s much shallower profile making more of the diamond visible from above. This is both easy and difficult in equal measure. Looking at her current rings, it may be that the majority are of yellow gold. This might be for a variety of reasons, rather than simple personal preference. When used in engagement rings, the vivid color of yellow gold suddenly becomes much more of a statement. As a result, it may be too much for her taste. Unless you have absolute proof that her preference is for yellow gold, a safer option might be platinum or white gold. Both work perfectly with diamonds, but also with other colored stones. Just to throw a curveball, though, don’t rule out rose gold. Rose gold is yellow gold with additional copper in the alloy to produce a matte pink finish. It is growing in popularity in all areas, but especially in engagement rings. It doesn’t have the vividness of yellow gold, but offers a little more than platinum and white gold. Be aware, though, fads come and go and jewelry is no different in that. Rose gold has now been around a while, but there’s no saying it will remain relevant as an engagement ring metal. All the above points deal with quite defined areas of choice. But one thing will determine the style of ring you get, above all others. Your partner has a personality unique to her. It will show in everything she buys from jewelry to clothes, even to the car she drives. This will be a great indicator of the level of quirkiness or the level of safety she adopts on a daily basis. Don’t use this as the sole reason for your choice, but use it to shape your final decision. If she is very open and elaborate in her choices, don’t be afraid to push past your own views on the matter. There can be no “I like it, so she will” about your choice of ring. If you want to marry her, it has to be assumed you know her. Dig deep and use the knowledge to influence your purchase. We can’t say this loudly or often enough. It’s not about you, it’s about her. It will be her ring, on her finger, for the rest of her life. You will have the supreme enjoyment of presenting it but, at that point, it’s all hers. Use your experiences within the relationship wisely when you choose an engagement ring. You will both be better off for it.